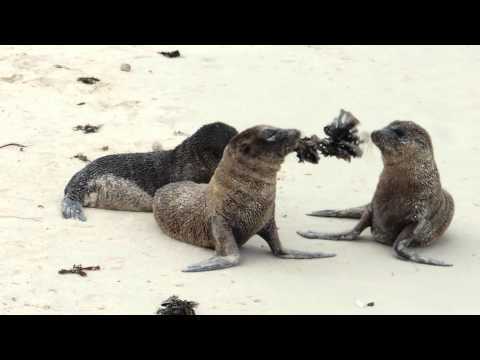 Sea lion pups playing with seaweed - with video. I have a few clips of them interacting with humans too which aren't suitable for PN. They were chasing us & trying to engage us in their games - it was just too cute! Eeee, aren't seal and sea lion pups just the silliest things ever? That video is so cute! I took a video of the fur seal babies, and I had the same problem - too many clips! I haven't even tried editing it down. These guys are so adorable, and I love that one playing with the seaweed!! What a wonderful spotting, Karen! They were hilarious to watch Luis, I ended up with way too much video & had to force myself to choose just a couple of clips! They are so awkward and adorable on land! Love the video of them playing, but my favorite is the 5th photo! Thank you Ali & Aleja! Good morning, It is a good photo.